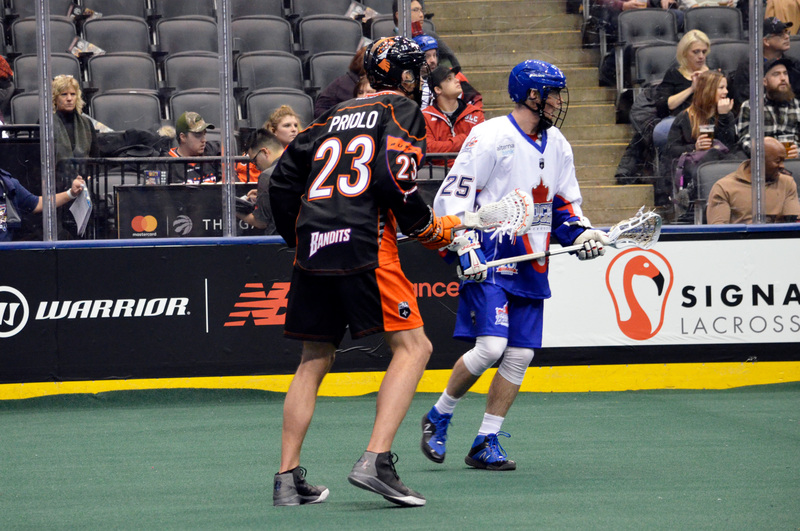 Buffalo Bandits’ captain Steve Priolo captivated the (lacrosse) world this past summer when he chose to live in his van while he played for the Victoria Shamrocks of the Western Lacrosse Association. It’s winter now, and he’s still living in it. Sometimes. For those unfamiliar with Victoria, B.C., its climate is pretty hospitable. Because it’s on the ocean, there aren’t usually too many days of extreme temperatures. It’s a better choice for voluntarily living in a van than say, Ontario, where citizens just endured two weeks of wind chills reaching -43 C.
Oh, did we forget to mention? Priolo’s back in Ontario for the winter. For the pair of outdoor enthusiasts, the cold temperatures aren’t a deterrent to van life. Priolo had previously played with the Shamrocks in 2015, winning the Mann Cup. In even years (2014, 2016, etc. ), he plays for the Brooklin Redmen in Ontario. With the WLA hosting again in 2017, he wanted another crack at hoisting the iconic trophy. Unfortunately, the New Westminster Salmonbellies defeated the Shamrocks in the league final and won the right to host the tournament. Priolo was obviously disappointed, but his summer in the van is a story that would have rivalled a championship win anyway. He drove out to Victoria in May, after outfitting the cargo van with wood paneling and flooring, a bed and lots of storage area, and Jacqui joined him when the school-year finished. They spent their nights camping out in the van down by the ocean and their days partaking in all the outdoor adventures they could. Victoria is on Vancouver Island, so having a car is almost a necessity if you want regular access to the mainland via BC Ferries. Priolo says that while Tofino, on the island and best known for surfing, was the main attraction in 2015, the van allowed him to explore a larger area. Other favourite activities included running, cliff diving, running, paddle boarding, running, fishing and running… up mountains. By the end of the summer, the van had gone from mostly white to a beacon of colour depicting the sunrise and sunset that Steve and Jacqui painted themselves. It was a true home, and though they are indoors more these days, the van will always be a big part of their lives. Priolo is hoping to steer his Bandits over .500 this weekend as they host the Vancouver Stealth on Saturday at 7:30 p.m. at KeyBank Center. The game can be watched live at NLLTV.com.